Beta | MiniCross Electric 12"
Beta | MiniCross Electric 12" MINICROSS-EElectric Power for Tomorrow’s MotorcyclistsThe all-new.. Beta | Minitrial Electric 20" XLMinitrial Electric 20” XLNew Minitrial-E, extends the wide ran.. Beta | Minitrial Electric 20"
Beta | Minitrial Electric 20" Minitrial Electric 20”New Minitrial-E, extends the wide range of .. Beta | Minitrial Electric 16"
Beta | Minitrial Electric 16" Minitrial Electric 16”New Minitrial-E, extends the wide range of ..
Kuberg | Trial HERO Electrische trialmotorDe Kuberg 'Trial E'. Voor de leeftijd 4 - 10 jaar. 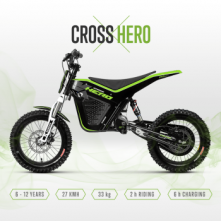 W..
Kuberg | Cross HERO Electrische crossmotorReady. Set. Ride! De CROSS neemt je 5- to 12- jarige van d..
Kuberg | Trial E Electrische crossmotorDe Kuberg 'Trial E'. Voor de leeftijd 4 - 10 jaar. Wil ..
Kuberg | Start Electrische crossmotorKUBERG START is de perfecte springplank in de wereld van motorf..
Electrische motoren, fietsen, trial, etc. Voor jong tot oud!